Welcome to the fifth week of the semester. By this time, students are dealing with the reality of just how much they have to do for their courses. Those who successfully navigate their busy course loads will likely have developed approaches to managing their time and learning. In the Learning Commons, we’re training our peer assistants, in addition to tutoring content, to support students’ relationship with time and tasks. As faculty, we can also address time management during office hours and at various points in the semester. Here are a few tips that I can share with you from our new tutor training program. Direct students to the Shepard Academic Resource Center: Here they can pick up copies of the Time Budget Sheet and the Semester Planner. They can also meet with SARC staff to discuss their plans and use of time management. Asking students how they are going about learning for your class can reveal a lot about their management of time for learning. From there, you can also help them to manage their time better. How students go about studying is also important. In their training, Learning Commons peer assistants also learn how to present students with Frank Christ’s Study Cycle model. This approach includes a preview prior to each class session, debriefing after each class, and the use of goal-oriented “intensive study sessions” that are short and that build in a break and reward. The Study Cycle model help students avoid “binge studying” on days when they have fewer classes. An excellent faculty resource for learning more about the Study Cycle, integrating it into students’ time management planning, and many other approaches to improving student learning is Saundra McGuire’s Teach Students How to Learn. 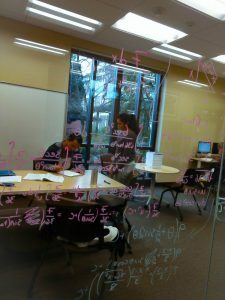 The Learning Commons is built on the idea that learning is social and more accomplished peers can support individual and group learning of difficult and abstract material. Students who schedule in time for group learning can enhance the learning experience while making it more efficient. As faculty, we can help students to connect with each other and explicitly encourage group learning. Break the procrastination cycle with the Pomodoro Technique. We use this short snappy video as part of our tutor training program so that our peer assistants can help students start tasks that may seem daunting. It may even help you to jump start work on your research projects. As students are developing a better sense of time for learning and how to use time, they can also improve their learning by thinking in terms of what Stanford researcher Carol Dweck refers to as mindset. We all can believe at times that our learning potential is fixed, but we can also believe that we possess the ability to grow and learn. Such a growth mindset seeks challenges and considers difficulties as revealing that we have not yet learned how such obstacles are to be overcome. As faculty, we can also remind students that challenges commonly take time and learning how better to learn is an ongoing process for us all. Dweck’s Mindset: The New Psychology of Success and Janet Zadina’s Multiple Pathways to the Student Brain are both helpful resources for faculty who wish to find ways to support positive changes in student beliefs about learning and their own brains. These are just some of the topics that we cover in our eleven hours of peer assistant training, and, of course, there is much more to learning and supporting student growth. In the Learning Commons, we will continue to develop our training and use of observation to grow our own potential to overcome challenges inherent to the work we do. I invite you to encourage your students to come to the Learning Commons to work with our peer assistants, and our door is always open for you to come see our peer assistants in action or to talk with me about student learning and how peer assistance can help student learning in your courses.